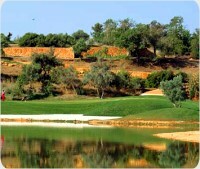 Silves is one of the latest golf courses, located in a serene spot, this course is anything but the proverbial walk in the park. Target golf reigns supreme. A drive at the opening hole has to flirt with two water hazards on both flanks. A heroic and straight shot will reward the player with an easy uphill approach shot. Silves encourages and rewards attacking play. It has a natural beauty and an elegant design. The excellent condition, all year round, is ideal for low scoring. A relentless test in precision, this course has no peers. It is the “archetype” of man-sized parkland golf. Take the road to the north from Portimão in the direction of Monchique and Silves and under the new A22 Motorway. From the access roundabout of the A22 follow the signs to Monchique and Silves. After a while follow the signs to Silves. 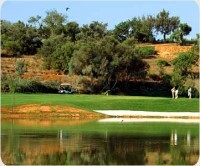 Once in Silves follow the golfe sign that will lead you to the Club House. Played this course in Aug 2008. The course is going to be a beauty in 3/4 years time. It is still good now as long as you play off whites, yellows are too short. Most holes make you think and course management is the key to success here. The clubhouse is very small and will be moved and upgraded within 2 years i was told. Unlike many courses it currently has NO apartments or Villa's but that will not be for to long ones guesses. Absolutely stunning course views to die for, looking up the fairways from the elevated tees. When in Portugal this course must be played if your an avid golfer.